Is an inflammation of the lower airways characterized by excessive secretion of mucus, hypertrophy of mucous glands, and recurring infection, progressing to narrowing and obstruction of airflow. 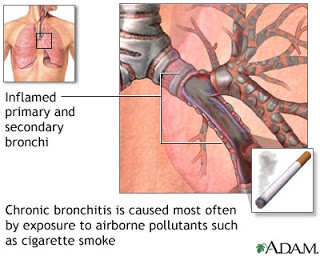 The primary cause of chronic bronchitis is smoking or exposure to some type of respiratory irritant. Established risk factors include a history of smoking, occupational exposures, air pollution,reduced lung function, and heredity. Children of parents who smoke are at higher risk for pulmonary infections that may lead to bronchitis. Productive cough lasting at least 3 months during a year for 2 successive years. Thick, gelatinous sputum (greater amounts produced during superimposed infections). 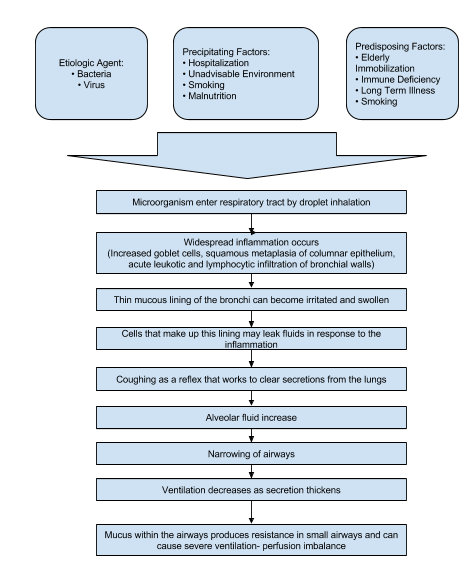 Dyspnea and wheezing as disease progresses. Pulmonary function tests, to demonstrate airflow obstruction-reduced forced expiratory volume in 1 second (FEV1), FEV1 to forced vital capacity ratio; increased residual volume to total lung capacity (TLC) ration, possibly increased TLC. Chest X-rays to detect hyperinflation, flattened diaphragm, increased retrosternal space, decreased vascular markings, possible bullae (all in late stages). Arterial blood gases, to detect decreased arterial oxygen pressure (PaO2), pH, and increased arterial carbon dioxide pressure (Paco2). Sputum smears and cultures to identify pathogens. Smoking cessation to stop the progression and preserve lung capacity. Low-flow oxygen to correct severe hypoxemia in a controlled manner and minimize carbon dioxide retention. Home oxygen therapy, especially at night to prevent turnal oxygen desaturation. Pulmonary rehabilitation to reduce symptoms that limit activity. Chest physical therapy, including postural drainage and breathing retraining. Lung transplant in severe cases of alpha1-antitrypsin deficiency. Bronchodilators to reduce dyspnea and control bronchospasm delivered by metered-dose inhaler, other handheld devices, or nebulization. Inhaled corticosteriods may be useful for some with severe airflow limitation and frequent exacerbations. Corticosteroids by mouth or I.V. in acute exacerbations. Antimicrobials to control secondary bacterial infections in the bronchial tree, thus clearing the airways. Alpha1-antitrypsin replacement delivered by I.V. infusion. Monitor for adverse effects of bronchodilators-tremulousness, tachycardia, cardiac arrhythmias, central nervous system stimulation, hypertension. Monitor oxygen saturation at rest and with activity. Eliminate all pulmonary irritants, particularly cigarette smoke. Smoking cessation usually reduces pulmonary irritation, sputum production, and cough. Keep the patient’s room as dust-free as possible. Use postural drainage positions to help clear secretions responsible for airway obstruction. Encourage high level of fluid intake (8 to 10 glasses; 2 to 2.5 L daily) within level of cardiac reserve. Give inhalations of nebulized saline to humidify bronchial tree and liquefy sputum. Add moisture (humidifier, vaporizer) to indoor air. Avoid dairy products if these increase sputum production. Encourage the patient to assume comfortable position to decrease dyspnea. Use pursed lip breathing at intervals and during periods of dyspnea to control rate and depth of respiration and improve respiratory muscle coordination. Discuss and demonstrates relaxation exercises to reduce stress, tension, and anxiety. Encourage frequent small meals if the patient is dyspneic; en a small increase in abdominal contents may press on diaphragm and impede breathing. Offer liquid nutritional supplements to improve caloric intake and counteract weight loss. Avoid foods producing abdominal discomfort. Encourage use of portable oxygen system for ambulation for patients with hypoxemia and marked disability. Encourage the patient in energy conservation techniques.